Hassan Al-Fadha and Consul General M. Shehryar Akbar Khan open the Pakistan Pavilion in Foodex Saudi Exhibition at Jeddah Center for Forums and Events. 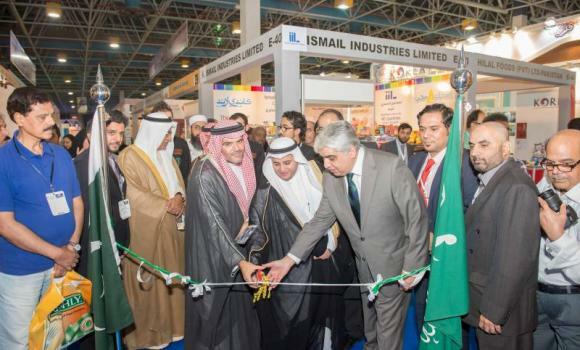 Trade Development Authority of Pakistan (TDAP) participated in Foodex Saudi Exhibition organized by Reed Sunaidi Exhibitions from Nov. 17 to Nov. 20, 2015 at Jeddah Center for Forums and Events. Pakistan Pavilion in the Exhibition was jointly inaugurated by Hassan Al-Fadha and Consul General of Pakistan M. Shehryar Akbar Khan. On this occasion, Shehryar said that promoting bilateral trade between Pakistan and Saudi Arabia is one of the foremost responsibility, among others, of Pakistan Consulate. He said that 14 Pakistani companies, are participating in the exhibition. The participating companies/exhibitors are among the top exporters from Pakistan dealing in fresh and processed products comprising meat, fish, fruit and vegetables, spices and confectionaries. Abdul Wahab Soomro, commercial counselor, said that while Saudi Arabia is the region’s largest food producer, with 74.1 percent of total production in the GCC, it imports more than $25 billion worth of food and beverage products each year to meet its consumption demands. He said that growing annually at 18.5 percent due to expanding domestic market on account of burgeoning population and increasing annual pilgrimage, Saudi Arabia’s food and drink imports are likely to reach around $70 billion per annum in the next four to five years, affecting all areas of the F&B sector. Reliance on imports is also likely to increase as the Saudi government has mandated to reduce wheat production to conserve water. These developments, Soomro said, offer huge opportunities to Pakistani companies to further penetrate in Saudi market and increase their market share. However, given the fact that Pakistan is an agricultural country and more than 50 percent of its exports are agro and textile based it has enormous potential to increase its exports by tapping halal food markets of Saudi Arabia, which currently imports more than 80 percent of its total food and beverages requirements.